Welcome to Wilbur's Rustic Creekside Retreat, the ultimate glamping experience situated in a wooded setting on Perry Creek! Named in honor of the original owner/builder, this historic property was recently restored making way for a true mountain getaway. Re-live your favorite summer camp memories with friends and family in your own private nature reserve with more than 20 acres to explore. The property feels worlds away, but is located just minutes from town and dozens of world-class wineries. Your Own Private Compound! 2 Cabins On 1 Lot - The main cabin features 2 bedrooms and 1 bathroom with a large living space, and glorious screened-in porch perched over the creek. The second cabin has a quaint, studio layout with it's own kitchenette, private bathroom and deck overlooking the creek. **Pricing includes use of both cabins; please inquire about alternate pricing if you only need one cabin. The grounds are magical, surrounded by grand pines and oak trees. Perry Creek runs the length of the property with plenty of options for relaxing and/or exploring. Book today and make this a vacation to remember for years to come! This is a rustic, glamping-style retreat designed to be a place to unplug and unwind. Take note, it is a TV-free property per the owners preference; however, complimentary wi-fi is provided. There is also no centralized air conditioning, but the owner does provide fans. Wilbur’s is such a unique destination. It’s so private and peaceful, yet within a short drive to many local wineries. When we were there the creek was running, so that was a special treat! The sounds of the water were so relaxing. We loved dining outside, watching the sunset, and just lounging around reading. We will definitely stay there again! Perfect family get away compound. Lots of space and room for everyone. and relaxing with the gorgeous trees and screened in porch for afternoon napping. The kids and our dog had plenty of room to run around. The beds were comfortable and we all slept in. We're making this our annual gathering spot. Thanks! Wilbur's Retreat provided a very nice and unique stay for our family to reconnect with ourselves, each other and the outdoors. Communication with the hosts Shelley and Sandra was great. We felt taken care of and safe on the property. The cabins are surrounded by tall trees and a creek. There is a large lawn out front that is perfect for sports, lawn games or taking a nap on. Our family rented both cabins which allowed us to all hang out together for meals and gatherings but to also have some alone time in our respective spaces. The kitchen is efficient and well appointed for meals - as with other remote cabins, I would suggest doing shopping and some meal prep before arriving. There are also some great outdoor gathering spots that we used for lunch and sunset happy hour. The location was excellent. You're surrounded by wineries in all directions and a handful are even within a 10 min walking distance (1/4 mile - 2/3 mile). Sandra recommend visiting Mitch at Shadow Horse Winery as well as visiting E16 tasting room - both were excellent suggestions. Placerville and other historic places are just a short drive away. This area also seemed popular with cyclists. We hope to visit again. Great place to unplug and unwind in cozy country comfort! Wilbur’s Rustic Creekside Cabin definitely has that cool mountain getaway feeling that begs you to unplug and unwind. We’ve stayed at the property on two different occasions while house hunting for a second home. It’s located in a wonderfully quiet and wooded setting and the owner Sandra has done a great job bringing style and functionality back to an old family property that needed updating. It’s rustic, yet has all the creature comforts of a mountain home — we love the sun porch and all the outdoor spots to relax, play games, read and just chill out. There are all kinds of things to do in the area, from wine tasting to hiking, river rafting, kayaking, skiing and shopping/dining in historic Placerville. There is also a local restaurant, The Pub, just a half-mile from the house if you don’t feel like cooking. 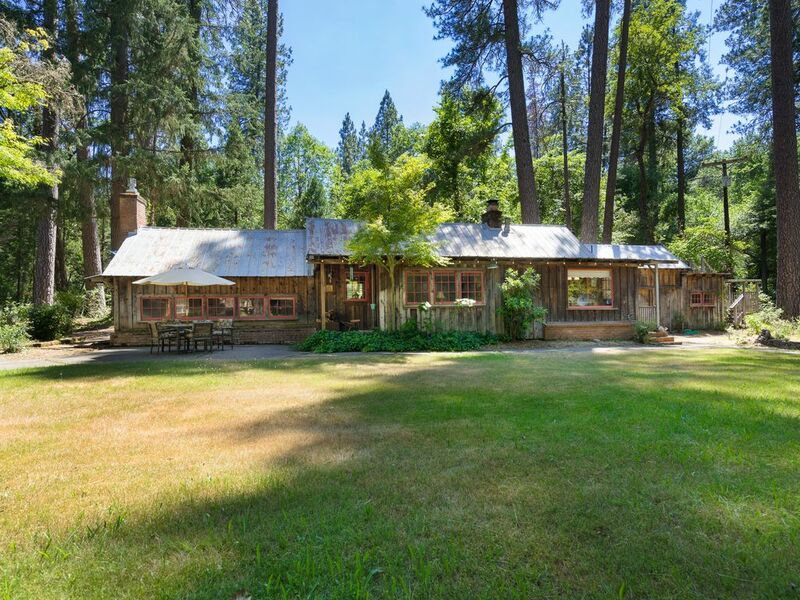 We look forward to returning to Sandra’s property again and again, until we find our very own special cabin in El Dorado County!